Chocolate Sour Cream Doughnut Bundt Cake ~ a mashup between a chocolate bundt cake and your favorite doughnut! 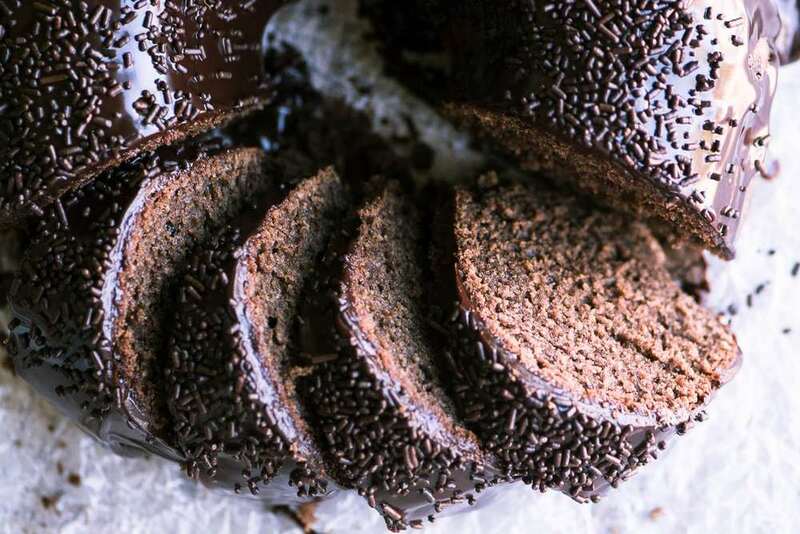 This chocolate doughnut cake is always a hit! Pour the batter into the prepared pan and bake for 45-50 minutes, until a toothpick inserted near the center comes out without wet batter clinging to it. I always check my cakes on the early end, at 45 minutes. Give it a few extra minutes if it doesn't quite look done. Set the pan on a cooling rack for 15 minutes. Then invert the cake and then let cool completely before glazing. It helps to loosen the edges with a small spreading knife first. Go along the outside edges and also the inside tube edge, gently prying the cake away from the pan to loosen it. To make the glaze, put the chocolate and the corn syrup in a bowl. Heat the cream until it comes to a simmer, I do this by putting it into the microwave for one minute, you can do it in a small saucepan if you like. Pour the hot cream over the chocolate and let sit for 5 minutes. Then stir until the mixture is creamy and glossy, with no lumps. If there is any remaining unmelted chocolate you can microwave it for a short 15 second burst to reheat the mixture. Let the ganache sit for a few minutes to thicken if it seems too thin. Pour the glaze evenly over the entire cake, and immediately shower with sprinkles.